Update: The fun isn't over for Deutsche Bank (and its weary shareholders). In fact, it might only be just beginning. Commenting to German newspaper Handelsblatt, the Frankfurt prosecutors office said it is investigating DB's role in help clients stash their money in offshore tax shelters while helping launder proceeds from illegal activities without informing German regulators. The wrongdoing that is being investigated allegedly began in 2013 and continued through this year. In a sign that the probe could run much deeper than initially believed, prosecutors said that gathering evidence will likely require them to continue searching DB's offices for a second day on Friday. The investigation, which was inspired by revelations contained within the 'Panama Papers' leak of client records from offshore law firm Mossack Fonseca, is so detailed that it will require searches to continue for a second day. "The investigations relate at least to a period from 2013 to 2018 and have been running since August 2018," said Nadja Niesen, spokeswoman for the Frankfurt public prosecutor's office. A spokesman for DB said the bank believed it had provided authorities with all of the documents they had requested. "We felt that we had provided the authorities with all relevant information about the Panama Papers. Of course, we will cooperate closely with the public prosecutor's office in Frankfurt am Main, because we too are anxious to clarify all suspicions. In recent years, we have always proven that we fully cooperate with the authorities. And we will continue to do so. One outside legal expert quoted by the newspaper said Deutsche's board had failed to properly ensure that the bank had effective compliance controls in place. Michael Hendricks, an attorney and expert in manager liability cases, says he sees the board as an obligation. "It is the foremost task of a board of directors to ensure an effective compliance system. Apparently, this does not work for Deutsche Bank. This is terrifying because the bank is always conspicuous," says Hendricks. The upshot: This is just the beginning of another potentially lengthy legal saga for the bank. Already a melting ice cube struggling with an overbearing derivatives exposure and myriad legal risks, Deutsche Bank has seemingly bounced from one criminal scandal to the next since the crisis, incurring billions of dollars in fines along the way. So it's hardly surprising that the bank's shareholders let out a collective groan Thursday morning when headlines hit that German police had raided the bank's Frankfurt headquarters. Roughly 170 police officers, tax inspector and prosecutors fanned out across Frankfurt to search a total of 6 DB buildings, according to the BBC, sending the bank's shares lower by 2% to near all-time lows amid renewed fears that DB could face a devastating, potentially bankruptcy-inducing, fine. Germany's public prosecutor has said the raid is connected with the role played by two employees in helping clients set up offshore account to launder money from criminal activities in offshore tax havens. Illegally gotten money may also have been transferred to accounts at DB, which then failed to report the suspicious activity, despite the fact that Germany's banking regulator recently appointed a supervisor to oversee an effort to improve AML controls at the bank. 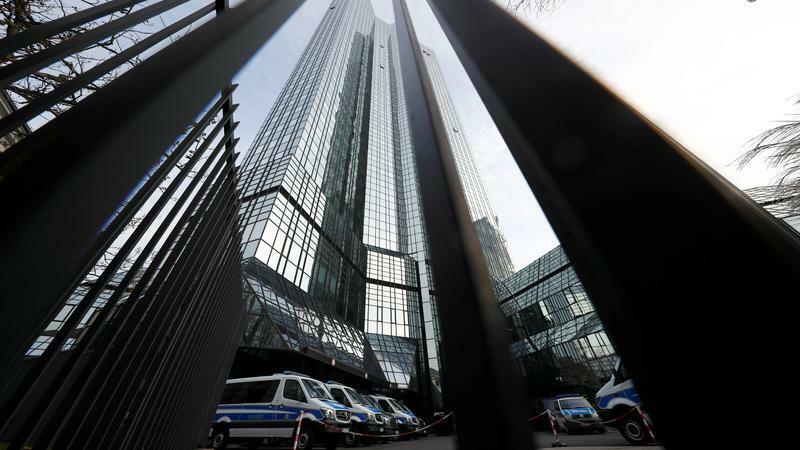 The Frankfurt headquarters of Deutsche Bank have been raided by prosecutors in a money laundering investigation. Germany's public prosecutor alleged that two staff members have helped clients launder money from criminal activities. Police cars were seen outside the tower blocks that house the headquarters of Germany's biggest bank. Other Deutsche offices in the city were searched in an operation involving about 170 police and officials. The raid comes as DB is facing inquiries pertaining to the role its correspondent bank played in facilitating the historic money laundering fraud at Danske bank's tiny Estonian branch. Earlier this month, a whistle blower implicated DB in the scandal and claimed that it helped clear $150 billion of the 'suspicious' $234 billion reportedly filtered through the bank by criminals in the former Soviet Union (and possibly even the family of President Vladimir Putin). DB confirmed the raid, said it was connected with the Panama Papers case, and said it's cooperating fully with the probe, according to the Wall Street Journal. According to Bloomberg, the bank said it thought it had turned over all relevant documents to prosecutors. Deutsche Bank in a statement confirmed an investigation involving an unspecified number of the lender’s offices in Germany. The bank’s statement, provided after the searches, added: "The investigation has to do with the Panama Papers case. More details will be communicated as soon as these become known." If it is fined for conduct exposed by the Panama Papers, it wouldn't be the first. Other European banks, including Sweden's Nordea and Germany's Handelsbanken, have been fined as a result of information contained in the Panama Papers. Anonymously sourced reports claimed that the raid was connected with the revelations in the 'Panama Papers' Mossack Fonseca document dump, which exposed the bank's role in helping wealthy individuals hide money from their respective countries. Back in August, German banking regulator BaFin demanded that DB improve its regulatory controls. These demands came nearly one year after the bank was fined $700 million for helping wealthy Russians move $700 million out of the country in the now-infamous 'mirror trading' scandal. In 2016 alone, more than 900 clients doing a combined 311 billion euros in business with the bank dealt with an opaque British Virgin Islands based unit of the bank. DB's new CEO Christian Sewing has only been running the bank for a few months. But as we noted earlier this week, he's already making moves to change up the senior management, as we reported earlier this week. Among a raft of executives expected to depart the bank was Deutsche's Chief Regulatory Officer Sylvie Matherat, who reportedly had expressed concerns about the bank's inadequate controls against financial crime. Matherat has told associates she might need to prepare to leave the bank, and has expressed unhappiness with what she described to some associates as constraints to improving financial-crime controls and mending Deutsche Bank’s relationships with regulators, some of the people say. "I hate surprises, but you don’t know what you don’t know," said Matherat, a lawyer and former deputy director general at the French central bank. Investors are clearly not happy. After all, if the bank becomes weighed down with toxic legal risks, it will be much more difficult for Sewing to sell it.